On his stand, the boss of the Italian company Volta, Silvio Revelli, gloats and shows to anyone who wants it, on his mobile phone, the interviews he made earlier in the day with the major American media, at the same time. occasion of the Consumer Electronics Show in Las Vegas, which closes on Friday 11 January. And too bad if one sometimes feels a touch of irony in the subjects that are devoted to him. His product, Mookie, got an unexpected exposure. The concept: a connected bowl, which, thanks to an image recognition system, ensures that the food intended for one animal in the house will not be eaten by another. "Or by a child"adds the affable Italian. A little further down the aisles of the Convention Center, the Chinese company iKuddle presents in preview a house for cats self-cleaning, with deodorizing functions. An application warns the owner when the litter runs out. These examples are not isolated. After purring on a small number of products - starting with trackers to find a lost animal - the "pet tech" ("technology for animal service" - takes flight, with proposals sometimes amazing. French companies are not left out. 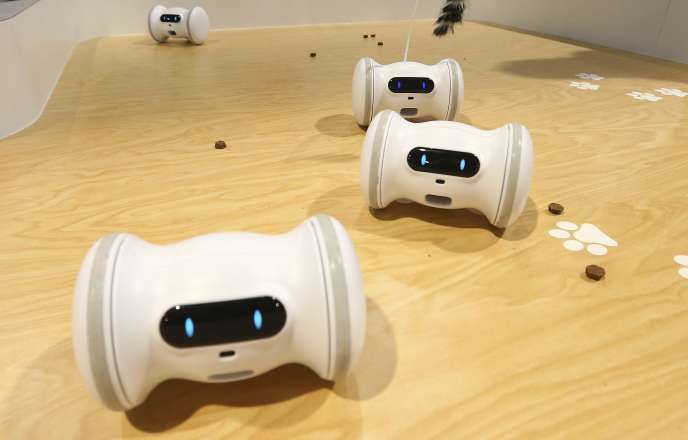 The company CamToy did not go unnoticed in Las Vegas: his robot Laika is a "companion for the dog", which allows the owner, when he is at work, for example, to be able to ensure, from his smartphone if the animal is fine and to address him at a distance. Laika can also interact autonomously with the animal, go to meet him to break his boredom, encourage him to do the activity and even throw treats to him. "This is not a surveillance solution, rather a stimulating solution for the welfare of the animal"explains the boss, Thomas Samtmann. The product is expected to come out by the end of 2019, if the young entrepreneur finds, in the next few months, the funds needed to go into production. Always for dogs, but also for cats, Invoxia has modernized animal trackers by exploiting the possibilities offered by the low-speed LoRa and Sigfox networks. His solution allows him to offer an object with a much longer autonomy (three months without recharging) than the competition and without subscription the first three years. Recently, its trackers have been added functions of activity watch of the animal that the company intends to develop. Arioneo, she is interested in horses, and especially in competition. The company has already developed several products, especially for coaches to analyze the performance of their foals and monitor their metabolic data. In Las Vegas, Arioneo takes an additional step by offering racecourse equipment - a connected strap for horses - allowing them to offer the bettors, before, during and after each race, the statistics of each horse, as displays the speeds on Formula 1 turn or the number of passes on football. "Our vision is that the horse market has not moved into the data age. With this one, we will be able to see things that nobody saw until then, to refine the valorization of a horse, to detect a future champion from the youngest age "enthuses Erwan Mellerio, the young leader. So many ways to sell its products in an environment where horse owners are willing to spend a lot on their animals. Even if everyone is not very connected, pet owners (dog, cat) are often ready to put their hand in their pockets to buy a tracker, especially if they have already lost an animal, says Serge Renouard. the boss of Invoxia. Last but not least, the animal market - or rather the animal market - is of a considerable size, and the commercial arguments that are worthwhile in France can easily be exported. Thus Thomas Samtmann has already a development plan well stopped, with the will to attack, from 2020, the American market and its 78 million dogs, then, very quickly, the Asian market. "The Japanese is a little bit our target: a city dweller, a technophile who works a lot and lives in small apartments with small dogs," says Mr. Samtmann, before recalling that the market of "pet tech" should reach 2.6 billion dollars (2.3 billion euros) by 2022. Unless, of course, that by then, these charming beasts were replaced in the heart of their owners by another star of CES: Aibo, the robot dog of Sony, alluring and less messy.